Can you feel it? This time of year there seems to be a little extra magic in the air, people seem to smile more, have longer conversations with people they don’t know, hold doors open and find ways to do more kind things for people. People they may know or they may not. Its the holidays! For some, the holidays is not a time of magic. As a social worker, I saw the needs during the holidays. The stiff upper lips of kids who wouldn't let their lack of presents bring them down. For the haggard parents working night and day yet unable to provide even the smallest things for their children. For some, the holidays are a time of hardship, of loneliness, and a harsh reminder of difficult circumstances. It is those people, for the people who stand in need during a time where people are overflowing with so much, that need a holiday miracle the most. Some people need a little extra magic given to them. My friend Colleen, who happens to be a food blogger, had the idea to reach out to other bloggers as well as some of their collective contacts to pull off a fantastic holiday surprise for 21 children who live in a small remote village in Alaska where one can only get in or out by bush plane or a small boat via the rough Nushagak River. 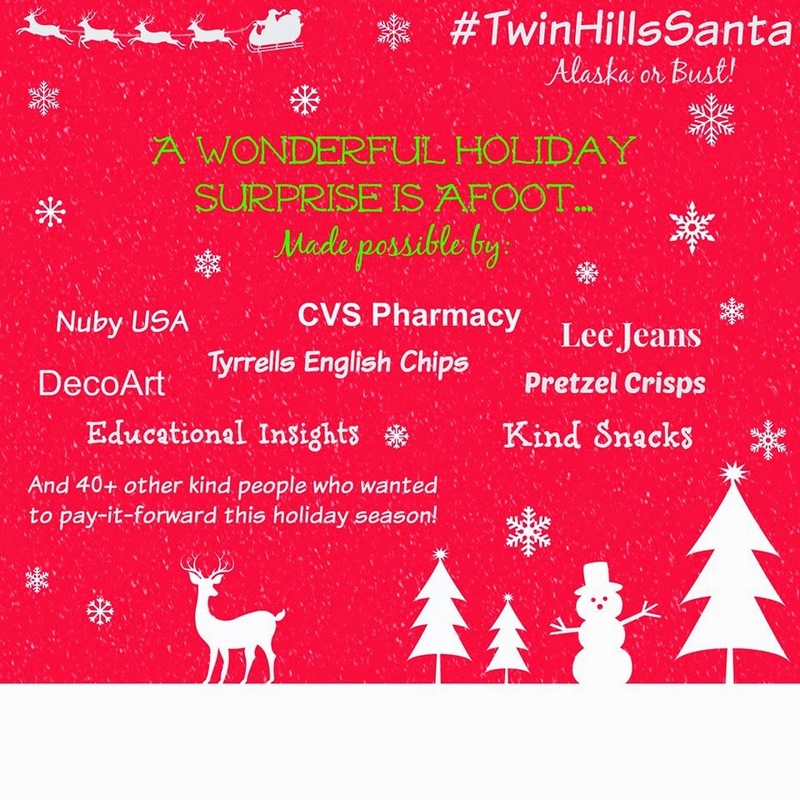 Over 20 bloggers from PA, NJ & DE jumped on board and #TwinHillsSanta began to take off. A friend (Dani) of Colleen’s took a position in the village teaching this year, Dani didn’t know what to expect when she packed up and moved from Pennsylvania, however she has already fallen in love with the people, their culture and Alaska. Let that sink in for a second…. This year...these kids have one heck of a surprise in-store for them!! We reached out to some of our contacts and I am so humbled and thrilled to share with you that they hopped right on board! Lee Jeans is sending clothes to the kids, those kids are going to be so excited and well dressed!! CVS Pharmacy is sending all kinds of personal products from toothbrushes to scrubbies and body washes, & shampoos to chapsticks, candy, small toys and much more! Nuby USA jumped in to send the younger children sippy cups, infant and toddler toothbrushes & toothpaste, toys and fun feeding plates & utensils! Tyrrells English Chips (who has the most fun website BTW) sent cases of their crazy delicious chips - those kids are going to be happily crunching away with a new-to-them snack! And speaking of snacks, Pretzel Crisps sent cases of their crazy-good pretzels - Boy are the kiddos in for a tasty treat! I see new fans just ahead! Educational Insights was happy to send the kids learning games, reading games, puzzle toys and more. These kids are going to be happy, busy and fine tuning their skills as they play! Kind Snacks shipped some of their healthy AND tasty Kind Bars to the kids, those will get them pumped up and full of energy! And DecoArt sent a bunch of craft supplies to the kids who I hear are LOVE making things and crafting any chance they get, they are going to be blown away! How awesome are these 7 companies who said YES to pay-it-forward! When stories like this reach my ears it makes me an even more loyal customer OR it makes me want to try/support a brand I am not familiar with! Thank you all! All of the bloggers involved made sure every kids will get a new pair of pajamas, hats, scarves, gloves and more! Then additional friends, some bloggers and many not heard what was happening and either grabbed USPS flat rate boxes or hopped on Amazon to send stuff the kids way! I can’t wait to share more specifics, which I will do in January once I get the intel from Dani as to how it all went. The pilot who flies in and out of Twin Hills with deliveries won’t know what hit him and neither will the post office! Magic is in the air!! When people come together...great things happen! Thank you Lee Jeans, CVS Pharmacy, Nuby USA, Tyrrells English Crisps, Pretzel Crisps, Educational Insights, Kind Snacks and DecoArt for making THIS a very special Christmas for 21 children, who I know are going to be so very grateful!